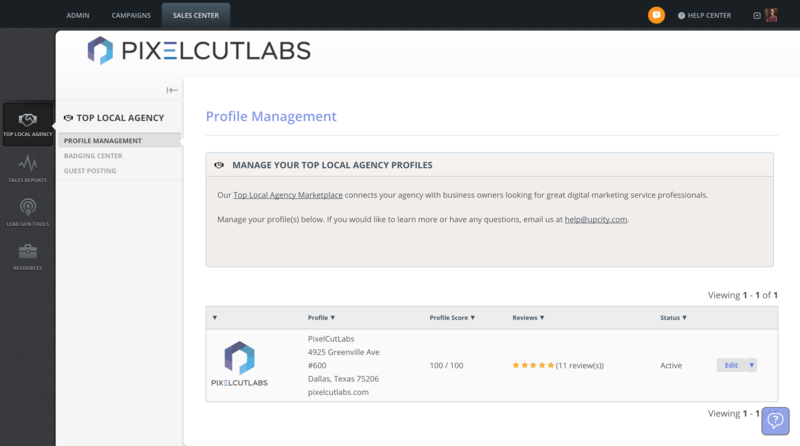 With Top Local Agency integration and an expanded resources section, the UpCity Sales Center is more powerful than ever. 2017 has been a year of change for us here at UpCity. We unveiled a new, cleaner look for UpCity.com and introduced our Agency Growth Engine to help agencies around the country grow their business more effectively. We reinvented ourselves and our services by combining three previously separate aspects of our business (the UpCity software, our Top Local Agency Marketplace, and our SEO Reseller services) into one consolidated platform. Now, we're continuing our efforts to bring these three sides together and help agencies get more leads, close more deals, and stay organized in the process with the introduction of the new Sales Center! Previously, the Sales Tools area of the UpCity platform housed our SEO Report Card and Competitive Rank Snapshot sales reports as well as our embeddable SEO Report Card sales tool. We've given the entire section a new name and a much-needed facelift. 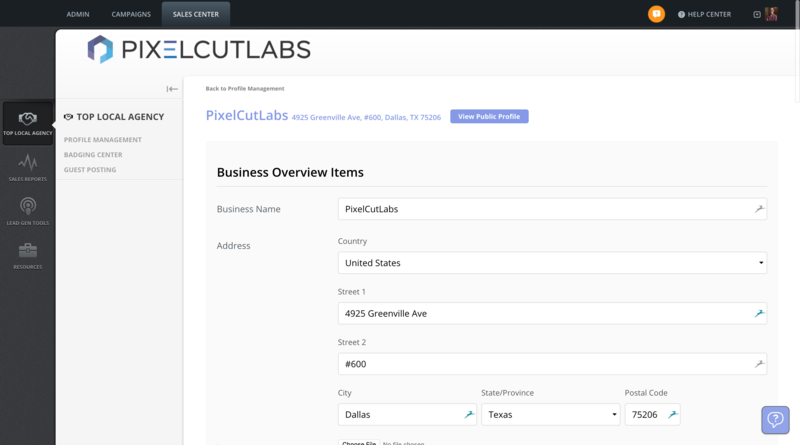 The new Sales Center contains those same reports and lead generation tool and adds a new Top Local Agency management area and an enhanced Resources section to provide you with the tools you need to pitch and sell your services. Previously, you needed a special link to make edits to your agency's Top Local Agency Marketplace listing. Now, it's as easy as logging into UpCity and opening the Sales Center. We've placed the new Top Local Agency tab front and center for easy access. You'll see your profile listed on the opening page; clicking Edit will allow you to modify the information on your listing (you can even click through to your public profile to see exactly what visitors to your listing will see!). The agencies we include on our Top Local Agency lists are proud to display our Certified Partner badges, and you should be too! 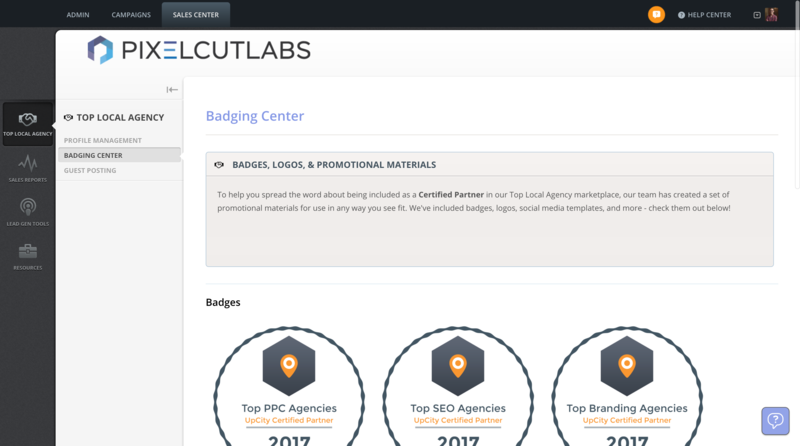 Our Badging Center allows you to download badge images, social media templates, and more to help show the world that you're one of the best agencies around! When it comes to SEO, there's no secret that content is king. With more than 30,000 readers every month, the UpCity blog is well-known for delivering great content for small and medium business owners and agencies alike. Now, our Certified Partners can leverage the UpCity blog as a vehicle to share their expertise with the world through guest posting. Our editorial team will help you craft the perfect post and promote it to our network of thousands of industry professionals and potential leads. Share your expert knowledge with the world and put your business in front of more eyes! Since we launched our embedded SEO Report Card, we've helped hundreds of agencies turn their site into an effective lead generation tool. Setting up the form on your site is as simple as grabbing a couple embed codes and copying them in the body of your site. That's it! Over the last few months, we've worked hard to extend the capabilities of our already powerful lead gen tool with the help of our friends at Zapier. Whereas previously your generated leads could only be accessed through the UpCity platform, Zapier allows our ProPlus users and above to integrate their leads into their established workflows. 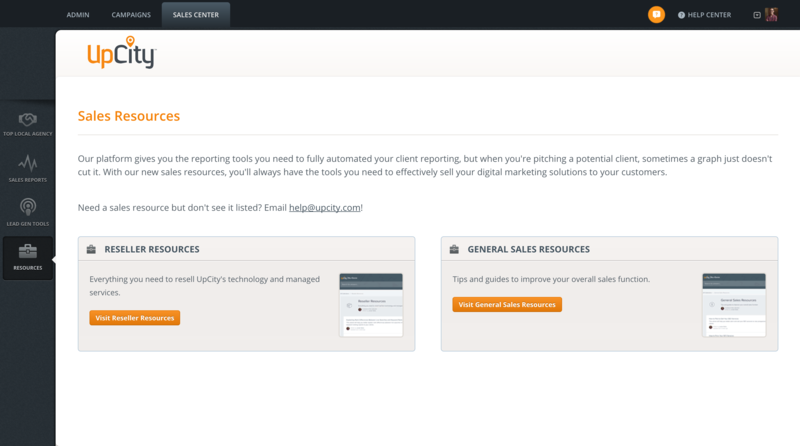 Whether you utilize Salesforce, ActiveCampaign, HubSpot CRM, or any of the other 750+ apps that Zapier partners with, your leads will always be at your fingertips! Seeing new leads roll in is great, but only if you can successfully close them! Luckily, our branded Sales Reports provide you with all the information you need to tell a compelling narrative during your pitch. Take advantage of two of our most popular reports, the SEO Report Card and the Competitive Rank Snapshot, and show potential clients you mean business! Sometimes you need more than a report to wow a potential client and close a sale. Our team of digital marketing experts have developed a wealth of information and resources to help you close sales and prevent churn. In the Reseller Resources area, you'll find sales deck, one sheets, and more to keep your presentations looking professional. The General Sales Resources area contains articles and FAQs to help manage and improve your client relationships. Need a specific resource but don't see it listed? Send your suggestions to help@upcity.com! Take Advantage of the New UpCity Sales Center Today! Login to your existing UpCity account to start taking advantage of our revamped Sales Center today! Don't have an UpCity account? Start your free trial today and learn how our Agency Growth Engine can help your business acquire more leads, close more sales, and scale your client relationships with ease.